Mrs Saley Lambourne (or Lamburn / Lambourn) died on 20 Jan 1899, aged 80. She lived at 33 Station Road. 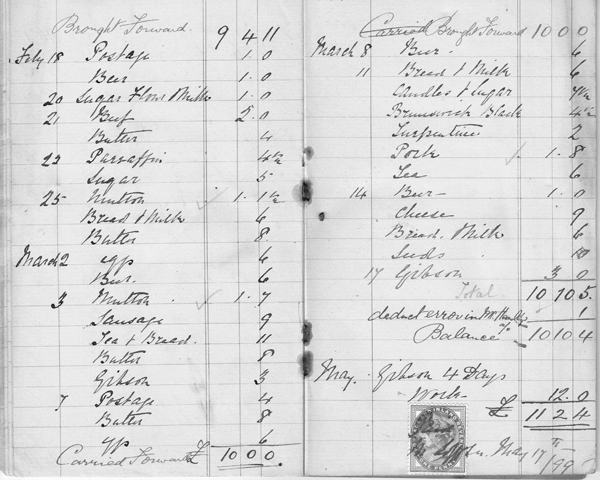 A notebook has survived with five pages of household expenses around the time of her death; the last two pages are shown below. It must have been kept by her servant - possibly Mary Holton, born at Kingswood, who was living with her in 1891. Her executor, to whom probate was granted in May 1899, was John Robert Gough, maltster and farmer of College Farm, Maids Moreton, whose wife Temperance (nee Holt) seems to have been Mrs Lambourne's great-niece. She left effects of £8,089. Mrs Lambourne was a farmer's daughter born at Edgcott in 1819, parents Richard Holt and his wife Sarah nee Badwick. Her first name appears as Sally, Sala and even Cecilia but Saley seems to have been the official form. She married John Lambourn(e), a farmer from Charndon, in 1864. They lived at Folly Farm, Hardwick in 1871, and had retired to 30 Buckingham Road, Winslow, by 1881; John died on 2 June 1881 aged 63. You can follow what happened through the accounts. Mrs Lambourne's last meal was mutton chops on 20 Jan. The next day the servant sent out telegrams to inform people of the death. Most of the expenditure was on 24 Jan, which must be the day of the funeral. Guests were served cold meat and wines and spirits. The servant, who mainly lived on meat, bread and eggs, evidently got a month's board after her employer died, and must have been allowed to stay in the house until May. "Gibson" in the accounts is probably William Gibson, described in the 1901 census as a jobbing gardener. Mary Ann Viccars of Avenue Road had a son Frederick George who was 15 at the time; they are probably the Mrs Viccars and her "lad" referred to. The most likely person to be "Mrs Williams" is Julia Williams of Horn Street, aged 45. The signature at the bottom is that of Martha Loffler, who lived next door and must have advanced the money for the expenses as she was the one who was reimbursed on 17 May (see Loffler family). She had been widowed in 1897 and in 1903 she married John Gough of Manor Farm, Maids Moreton, the executor's father; he died in 1908 aged 84. Perhaps Mrs Lambourne had introduced them. Brunswick black: quick-drying black varnish used for metal, particularly iron, stoves, fenders, and surfaces of indoor equipment.